Choosing the best long eye relief scope for you brings a unique set of rules into play. Evaluating the right criteria is not always exactly an objective matter, and we don’t necessarily mean the lenses. A lot depends on what fits you individually as a shooter, the weapon that will bear the scope, and how each scope looks and feels in relation to your mechanics. Eye relief refers to the number of inches you can hold the scope from your eye while still seeing a full image through it. Any optic with six inches or more of eye relief could generally be called a “long eye relief scope.” Though typically limited by nature in power, hunters prefer them by far for large revolvers over simple iron sights. In fact, they are virtually the only scopes nearly any handgun will accommodate due to the optics’ short magnification levels (ideally, no higher than 8x) and the optimal choices for notoriously heavy-recoil calibers. Scopes with shorter eye relief risk severe eye injuries when the weapon kicks suddenly backward with extraordinary force upon discharge. Long eye relief scopes perform best with small, lightweight designs. In order to serve the implied purpose of their name, they tend to be shorter in length and mounted farther forward on the barrel than an ordinary scope. Consequently, an overly heavy scope positioned as such would affect the firearm’s overall balance. Due to the extreme recoil of the weapons for which they are most often in demand, a worthy long eye relief scope has be extremely durable to sustain ample force repeatedly. Given their more modest stature, most will usually function with fairly simple workings and, owing to their inherently smaller objective lenses, smaller sight pictures. UTG 2-7X44 30mm Long Eye Relief Scout Scope – For all the understandable limitations that come with their necessarily compact average size, there really isn’t much excuse for poor clarity. That being said, the UTG 2-7X44 disappointed me despite having the second-largest objective lens of this group. The fact is, I loathed the emerald lens coating. I understand that it was likely a consideration for bringing out the green of surrounding foliage in a forest setting, but with a very select few subjective exceptions, tinted coatings are more gimmick than any impressive actual usefulness. 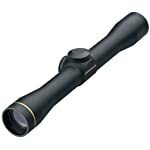 Vortex Optics Crossfire II 6-24x50mm AO Riflescope – Few manufacturers ever come close to equaling the clarity of Leupold’s glass, but Vortex routinely comes as admirably close as any affordable manufacturer except possibly Bushnell. Fashioning the housing from a single block of aircraft-grade aluminum into one uninterrupted tube and sealing it from the inside with a perfect O-ring makes the Crossfire II’s interior impenetrable to moisture and particulates. Adding a sunshade for frustratingly bright daytime conditions ices the cake. Leupold FX-II Scout 2.5x28mm Duplex – While I could hardly recommend any Vortex scope adamantly enough, I have yet to come across craftsmanship at any but the very utmost price ranges that exceeds Leupold’s impeccable glass. Their lenses undergo a combination of their proprietary Multicoat 4 processing and an anti-glare interior coating to diminish reflection and glare to an unrivaled negligible level and allow their optics to soak up every iota of light surrounding them. Furthermore, in my opinion, only Bushnell and Vortex have managed to compete for flawless waterproofing and fog-proofing. UTG 2-7X44 30mm Long Eye Relief Scout Scope – I do not have a single patently “negative” remark for the 2-7X44’s construction. The UTG-proprietary True Strength Platform (TSP) is a revolution in controlling the joint-like interaction between the inner and outer tubes to maintain optimally responsive and thoroughly precise windage and elevation adjustments. It ties with the Crossfire II as the longest of the three scopes measuring 14.5 inches but weighs in second-lightest, tipping the scales at 1.6 pounds. However, it also offers nearly a foot of eye relief and fits perfectly with any firearm where the scope cannot mount directly over the action. Vortex Optics Crossfire II 6-24x50mm AO Riflescope – Just as it seems almost a fool’s errand to attempt to trump Leupold’s signature clarity, I have a hard time imagining craftsmanship that could trump Vortex’s singular construction. Between being composed of a single uninterrupted 30mm (14.5-inch) super-strong, rigid body internally sealed by form-fitted and steadfastly secured O-rings and waterproofing the interior by filling it with dry nitrogen to eradicate moisture, these may be the closest anyone will ever find to a legitimately unbreakable scope. It might outweigh the atom-weight Leupold at 2.5 pounds, but there is absolutely nothing tougher in its field. Leupold FX-II Scout 2.5x28mm Duplex – The calibers that inspire the greatest demand for long eye relief scopes typically are not geared toward ambitious distances that make powerful magnification a must. However, it isn’t exactly an entirely moot topic. It’s curious to think of any Leupold scope coming in “last” in any sense, but the numbers are what they are: the FX-II Scout offers only 2.5x magnification, albeit with a nice 22-foot field of view at 100 yards. 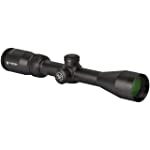 Vortex Optics Crossfire II 6-24x50mm AO Riflescope – It’s a tough choice deciding who comes in second-best. Granted, Vortex possesses a superior overall magnification range – 6-24x with a 50mm objective, to be exact. On the other hand, it isn’t without its flaws. Specifically, despite its outstanding eye relief, it exhibits minor-but-noticeable blurring in full sunlight at maximum power. It still presents crisp, clear images at lower magnifications, but its remaining counterpart still has it beat. UTG 2-7X44 30mm Long Eye Relief Scout Scope – Hear me out. Yes, the 2-7X44 has “only” a 2-7x magnification range. Yes, the Vortex’s objective tops UTG’s 42mm objective lens. From experience, though, I simply preferred the scope that maintained a perfectly consistent, clear, and bright picture across all magnifications rather than the flawed one that had a wealth of settings I wouldn’t need for my intended uses and would rather not pay for if I can avoid it. UTG 2-7X44 30mm Long Eye Relief Scout Scope – UTG is absolutely not to be sold short in terms of putting shots where they belong. Its six Mil-dot etched reticle illuminates in either dual- or 36-color mode to meet the needs of any combination of weather and light conditions. Parallax adjusts from as little as 10 feet away out to infinity. If anything should need adjusting, its zero-lock, zero-reset target turrets dial in ¼ MOA windage and elevation adjustments that lock in and stay put. Leupold FX-II Scout 2.5x28mm Duplex – There’s just no discounting the value of calculated European design. Leupold doesn’t offer as many unique little features that make accuracy easier as the Crossfire II. It doesn’t really have a “gimmick.” It’s a matter of simplicity and perpetually tweaked performance combining with ¼ MOA adjustments and Leupold’s traditional duplex reticle to make a scope that can drive tacks at absolutely any range on just about any gun. It’s a triple-tough little scope that hits dead-on despite have by far the smallest objective lens, lowest magnification, and fewest extra tools in its belt. 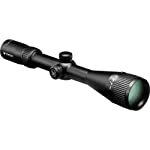 Vortex Optics Crossfire II 6-24x50mm AO Riflescope – Obviously, accuracy comes before the vast majority of other considerations. I have always liked the glass-etched reticles Vortex employs on the second focal plane of a number of models. In addition to allowing the dead-hold BDC reticle to retain its same ideal scale at any magnification, including subtensions that estimate range, holdover, and wind-drift with phenomenal accuracy up to 18x eradicated my guess work on tricky long shots. There’s also no discounting the extent to which the single-piece body enhances accuracy with the streamlined mass and limited moving parts. Thanks to the exactitude of resettable MOA, the Crossfire II routinely dials in one-inch groups even after over an hour pumping out dozens of rounds. Between these two elite manufacturers, you could not go conclusively “wrong” calling either scope the best long eye relief scope for your money. Both admirably combine every special consideration that a long eye relief scope has to check off to meet the needs of shooters who demand them. They are both compact while retaining ounce-for-ounce durability on par with any larger short eye relief optic. Neither loses a trace of accuracy for their pared-down dimensions. However, if I have to choose one, Leupold’s almost impossibly low weight and elfin length win my favor.